The new Body Solid Series 7 Smith Gym allows you to develop muscle mass beyond your imagination at a rate that will amaze you. You get virtually all the same exercises as you do in a fully equipped gym, but in the convenience of your own home, on your own schedule, without the need for a spotter. This is not just another smith machine. The process of developing a cutting edge, state-of-the-art Series 7 Smith Gym System that meets Body-Solid's meticulous standards of quality that has not been easy. While other companies have rushed to get their smith gyms to market, we've taken the time to get it just right. Now, with the Body-Solid Series 7 Smith Gym System, you can trust that you're getting the best system available. Our Series 7 Smith Gym System gives you the freedom of movement you need to do your exercises correctly. The Series 7 Smith Gym is based on a 2"x 3" commercial quality mainframe and set to a 7 degree reversed pitch. The 7 angle was designed to allow natural upper and lower body movements for precise chest and gluteal biomechanics. Over 50 exercises are available on our Series 7 Smith Gym System and all of them can be done correctly under your control. Every set, every rep, every movement. That is how you get real results. And there's only one thing you want from your gym system. Results, Bigger, Faster, and Stronger! 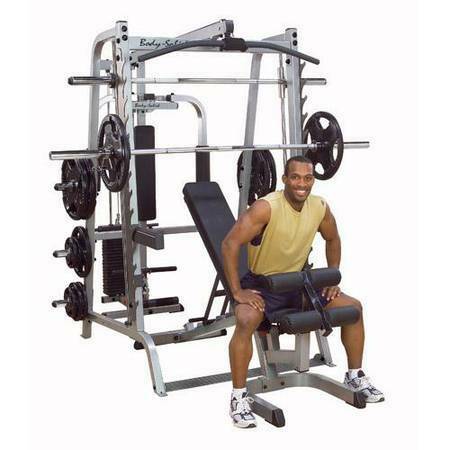 Precise 7 degree angle Smith Machine combined with 7 angle freeweight barbell workout center designed for natural upper and lower body exercise movements. 210 Lb. Selectorized Weight Stack Lat Attachment - Perform any high or low pulley exercise with no down time thanks to the no-cable-change design. Includes precision machined 210 Lb. steel weight stack with special add-on weight plate posts for extra resistance when you need it. Pec Attachment - Extra-thick arm roller pads and DuraFirm"! back pad make performing pectoral flys comfortable even with the heaviest weight. Unique design allows both unilateral and bilateral movement #GPA3. Commercial Flat / Incline / Decline Bench- Full commercial design can handle over 1,000 Lbs. Eight-position back and seat pads adjust from decline to a 90 shoulder press position #GFID71. 6-Roller Leg Developer - Work your quads, glutes and hams safely strengthening your knees. Features over-sized 8" rollers for total comfort through the most intense leg workouts #GLDA3.